Throughout the entire year in 2013, we seemed to see highs everywhere we looked. Unfortunately, the year 2014 hasn’t been so friendly. The simple fact is, for the last month and a half we’ve watched as emerging markets seemed to crash, Apple reported that it couldn’t sell its flagship product, and more and more stock values going down. These are the types of things that generally scare people when it comes to investing. That’s why few want to invest in a down market. However, that fear of loss is what’s stopping so many people from realizing profits. Let’s think about the reason you’re investing in the first place. You want to put one dollar in, and pull out two, then put the two in and pull out four. You’re not investing because you think it’s cool when the line on the chart points to the upper right corner of your screen, you’re investing because when it does so, you make money. We invest for profits. Now, let’s think about how we make profits. Drum roll please…we make profits by buying low and selling high! The answer to the big question, “Why should I invest in a down market?” is simple. Investing while the market is low gives you the opportunity to buy at incredibly low prices. When else are you going to get a 10% discount on stocks? Although the market may be down when you buy the stock, it’s not going to be down forever. By making the right decisions with regard to what to buy, you stand to make a killing off of the down market! Now here’s your key. No matter if the market is up or down, you’re going to have a hard time realizing profits if you’re not making the right investment decisions. In a down market, that’s even more important. The simple fact is, most companies are going to bounce back from hard times, but some will not. If you put your nest egg into companies that have a low likelihood of bouncing back, chances are you’re going to lose. That being said, here are a few tips that should help you make the right investment decisions. Think About The Companies That Make Survival Possible – OK, so we would survive without companies, we did it before civilization reared its nasty head! However, surviving wouldn’t be half as fun for many people if it wasn’t for companies like Wal-Mart, Google, and Ford. If it wasn’t for Wal-Mart, where would we get our food and such; if it wasn’t for Google, we’d have a hard time finding information we need; and if it wasn’t for good ole Henry Ford, we’d still be riding behind horses, not enjoying horse power! When you invest in a down market, think of the companies that have no choice but to bounce back! Watch The News – Ever since I first got interested in investing, I found this one shocking, but true. The truth is, no matter how great, or bad a company is doing, the news changes the views of that company from the eyes of the investor. If big stories come out saying something negative about a company, chances are, its stocks are going to fall faster than a penny dropped from the Empire State Building and vice versa. So, watch the news and look for opportunities to capitalize on. Don’t Use Knee Jerk Reactions As An Investment Tactic – I’ve seen this one way too much. At the slightest change some investors will either buy or sell. It’s important to remember that profiting from investing usually happens over time. Throughout this time, you’ll see ups, downs and static moments. In most cases, it’s OK, just ride the roller coaster and enjoy the fruits of your labor when you’ve made an educated decision that now is the best time to sell. Down markets shouldn’t scare you out of the market, it should do the exact opposite. When the markets are down, your eyes should open with excitement because you see opportunity. I hope that my tips will help that to happen. 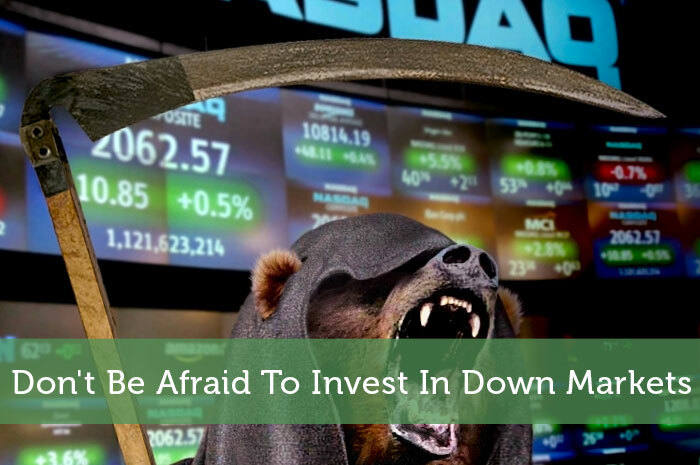 Do you have any other tips that you would give newbie investors with regard to investing in down markets? My only comment would be to just invest. For many, investing means that they are going to keep their money in the market for close to 30 years. Regardless if the market seems high or low today, it is probably “low” compared with 30 years from now. The long-term trend of the market is up. Look at any chart and you will see that over the long-term, the stock market goes up. You will never experience any growth if you never start investing. So ignore what the market is at today, start investing, and stay invested for the long-term. I fully agree with you. Any downs here will likely be little blips that you can hardly see in your screen 30-40 years from now. Also, that picture headlining the post is so funny. It made me laugh so hard. Whilst I completely agree with this in theory, in practice it is akin to timing the market. I did some research into this using historical figures and there really isn’t an easy way to time any market. So, whereas one should not wait for falls to invest in a down market, they equally should not be afraid to invest when the market does slip. Invest regularly and for the VERY long term. The lazy man’s formula for success! dollar cost averaging makes it work out in the end! obviously, if you were close to retiring, it might not be the best idea to put all your money into stocks. One thing to do when the markets are going down is to keep investing if you think fundamentally the company has a good business. That way you can lower your PPS (price per share) and have far more upside when the markets increase. You make good points. I agree with Moneystepper regarding being careful about trying to “time” the market. But in practice, I am more inclined to invest on the dips. It is always a stock I would be buying anyway. For example, Coke, which is down close to 4% on the earnings report last week. I’m buying Coke for the long haul, so buying now gives me a better price and therefore better return in the future. I think investing when the market is down is the best time to buy stocks. You just need to wait for it to bounce back again, then you sell your shares. Easy money for you. Down markets is what every future investor should be aspiring to see, if you are not currently invested yet. The problem is that people need to understand the secret language of the stock market. The stock market doesn’t speak like we do, it has secret messages. For example when the stock market is down, you should hear everything is on SALE!! If you would hear that at your department store I’m pretty sure you would rush to get there as soon as possible, same thing goes for the stock market. Also if the economy is performing badly, there are many other stocks you should focus on such as non-durable market stocks such as proctor and gamble, General Mills, these are the kind of products people “need” to have everyday, such as toothpaste or shampoo, not because the economy is in recession or in bad shape people are going to stop spending in their day to day toiletries. For the average investor, dollar cost averaging would really be their best option. But definitely have enough liquidity on hand to take advantage of a crash… which will happen again.